The stage is set for another high-voltage drama as we head into the business end of the Big Bash League 2019. Brisbane Heat are ready to lock horns with Melbourne Stars at the Gabba, Brisbane in their last home game. The race to the semi-finals has lightened up with only a games to handful of games to go. Both the teams would be hoping to emerge victorious in this crunch contest. Brisbane Heat have had an indifferent campaign this season, from being the favorites to struggling to qualify for the playoffs. Currently, they have taken up the sixth spot in the table with 11 points to their name. With five wins and seven defeats in their 13 outings, Brisbane Heat have to win this match to stay alive in the tournament. Brendon McCullum has also announced his BBL retirement, so he will be willing to make his last game a memorable one. The home side won their previous match by six wickets against Adelaide Strikers. Melbourne Stars meanwhile, are currently sitting in the fourth spot with 12 league points and a couple of games in hand. The Stars have six wins and as many defeats in their 12 league games. They would be hoping to book their semi-final berth in this game itself and not leave it for too late. Having lost their last match against a struggling Perth Scorchers side by 27 runs, Melbourne Stars need to bounce back in the upcoming game. Here's your complete preview of the clash between Brisbane Heat and Melbourne Stars. Brendon McCullum will play his last home game for Brisbane Heat. Brendan Doggett has been recalled to replace Sam Heazlett. Our Squad is in for @Bazmccullum's Gabba Farewell tomorrow night! Liam Plunkett is likely to make way for Sandeep Lamichhane. Sandeep returns for our match v Heat tomorrow night! Brisbane Heat: Max Bryant, Brendan McCullum, Chris Lynn (C), Matt Renshaw, Jimmy Pierson (WK), Alex Ross, Ben Cutting, Jack Prestwidge, Josh Lalor, Matthew Kuhnemann and Mitchell Swepson. 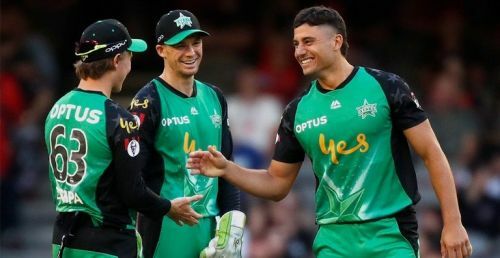 Melbourne Stars: Marcus Stoinis, Ben Dunk, Peter Handscomb (WK), Glenn Maxwell (C), Nic Maddinson, Dwayne Bravo, Evan Gulbis/Seb Gotch, Adam Zampa, Jackson Bird, Sandeep Lamichhane and Daniel Worrall.